Wisdom bomb, mantra bomb, craftbomb…I dont know what to call it but I like it! I heard a quote recently about how if you knew how powerful your thoughts were, you’d never have a negative thought again. This newest ‘craftbomb’ is inspired by this idea. I often use symbols in my crafty street art to spread an idea or message but rarely words. This is partly because I have been travelling through Asia where English is not the primary language; but also because knitted shapes are able to communicate non-verbally rather well. That said, my knitting mojo has been low since I finished the yarnbomb for Vietnam, so I needed to switch things up. Fortunately, my backpack-crafting kit is able to accommodate both knitting and embroidery and I had a project on back order. FYI: Embroidery is an excellent craft for long term travel on account of its very impressive portability. One additional point for Embroidery please! Now back to the importance of words. Words have a powerful effect on us, both consciously and subconsciously. Some people leverage this wisdom, by repeating valuable and empowering messages, or mantras to themselves during times of frustration or struggle. It may not seem like a radical technique, but you can be sure it’s an effective one. In the short-term, you have a strategy that can boost your energy and morale when you’re ready to give up. In the long-term, your consistent efforts pay off in the form of an empowered world view. Whats not to love about that? These two shirts were completed on request by my favourite bearded man. They aren’t my typical, street-arts and craft style, but they do trumpet a message for all to see. My hope is that they prime everyone who sees them to think positive, empowering thoughts. Just having them around the bungalow has definitely been an inspiring force for me. I’ve been applying the Will Can Do mantra to my crafting goals (and challenges) and come out feeling very ambitious. If you want a visual of the power of positive thinking, check out this wild video. This little guy clearly lives by the Will Can Do philosphy *pun intended! 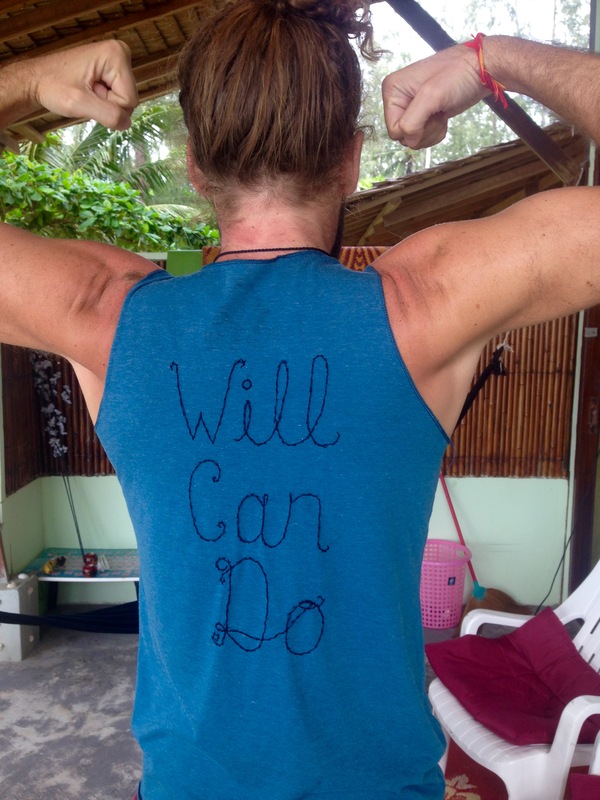 Will Can Do is a powerful mantra, one that can both pick you up and propel you forward when you need it. Anybody out there use a mantra? If not, give Will Can Do a try next time you feel challenged and be sure to check back in with your results in the comment section below. I am on both Twitter and Instagram and would love to hear from you. Also, I am experimenting with a new look on the blog so take a tour and let me know what you think. Thanks so much! You make Embroidery Empowerment sound so epic! What a great idea, and a great mantra! And yes, I believe you that embroidery must take up a lot less space than knitting when traveling. 😉 You have a knack for it, that shirt looks fantastic! Thanks Susanne! You’ll have to keep embroidery in mind for your next big trip-but for now, enjoy the bounty of yarn in Canada! Awesome mantra! I’d be curious to know what you keep in your backpack crafting kit – I’m always overpacking crafts for even the shortest of trips! Hi Pamela. It’s hard finding the right kit, right? What worked for me was a little travel sewing kit- with an embroidery needle and thread added. One set of magic loop knitting needles, 2 darning needles and a stitch counter. It was really practical for fixing up mosquito nets too! How do you usually roll? Oh cool! I saw this project on Instagram waaaaay back before Christmas, so it was nice to finally read the story behind it. The finished shirts look great – it’s a super idea! Thanks Crawcraftbeasties! Its serving as an under layer these days but still inspiring!